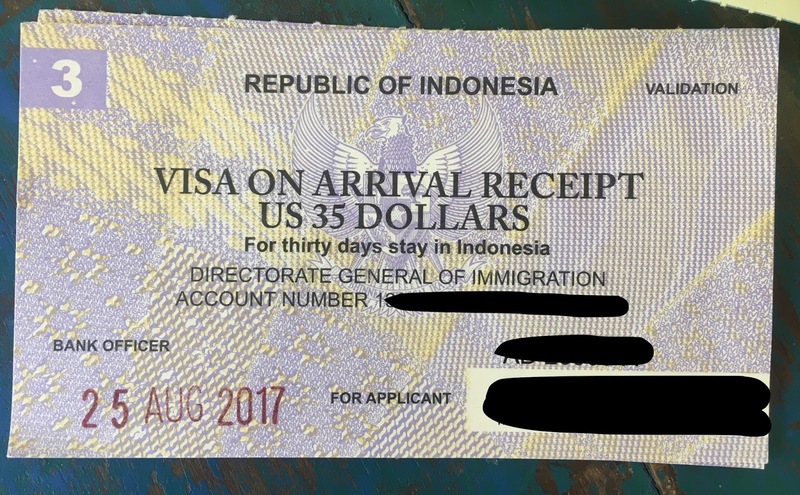 If you are planning to visit Indonesia (Bali, in this case) for under 30 days, citizens of most countries can enter visa-free. 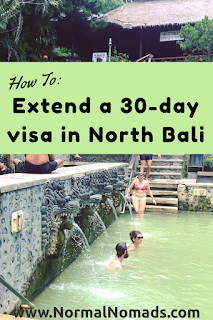 If you want to stay in Indonesia for more than 30 days (we are staying in Bali for 60 days) then you will need to buy a 30 day tourist visa, then extend the visa for another 30 days. 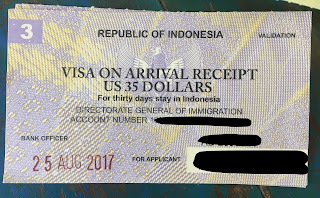 Extending your 30 day tourist visa in Singaraja is actually pretty easy! 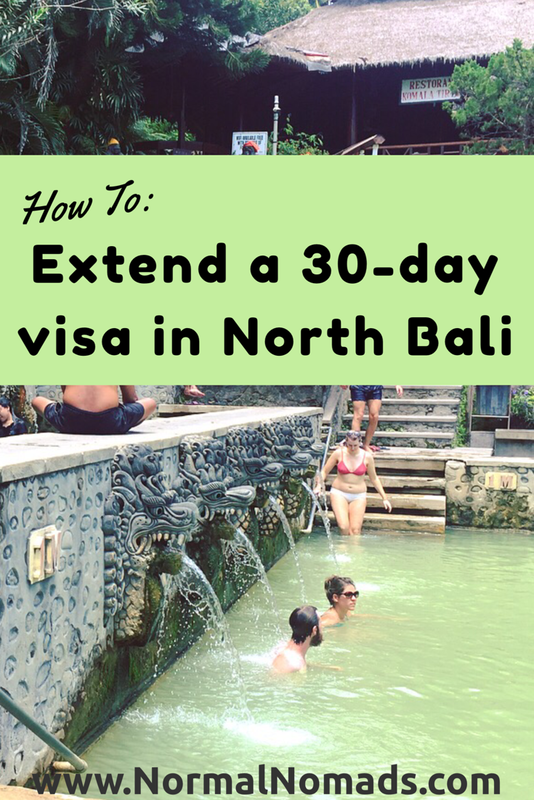 Here's how you can stay in Bali for 60 days, the cost of the visas as of September 2017, and how the process works in the North Bali immigration office in Buleleng, near Singaraja. I recommend coordinating your visit so that you are in North Bali for this process. It was remarkably simple and fast, as compared to the process described by Floating Leaf. Note that this takes three visits to the office so do not plan to travel far during this time. 1. Buy a 30 day tourist visa on arrival (VOA) for US $35. You must buy it on arrival! Do not be fooled if no one is at the booth; do not stand in any other line. Go straight to the VOA booths and ask any official for help. Do not lose this receipt! 2. Visit your local visa office 10-14 days before your visa expires. Bring a black ink pen. Pick up a visa extension form at Counter 1, and fill it out. You will need to know your name, address, phone number, and email address of where you are staying in North Bali. Don't forget to fill in the front of the folder! Bring your VOA receipt to show to immigration. They will tell you to sit down and you wait for your name to be called. This is a different receipt, but it will look a lot like this. 3. Return on the day that they told you to return, some time before 12pm. For us, this was two days later. Bring your receipt directly to Counter 1. Don't wait in any line. When your name is called, go into the room where pictures are taken. They will have your passport and folder, and will take your picture and all of your fingerprints. After your photo/fingerprints, exit the room and go to the Cashier. Give the Cashier your receipt, and IDR 355,000 per person. You will receive another receipt, again acting as your passport, so do not lose it! 4. Return for a third time on the date they told you to return. In our case, this was the next week, but two business days later. Bring your receipt and go immediately to Counter 1. Give them your receipt. Wait until they call your name, and pick up your passport. Done! That's all! Relatively easy in North Bali as compared to congested areas like Ubud or Denpasar. If you have any questions, feel free to comment below. 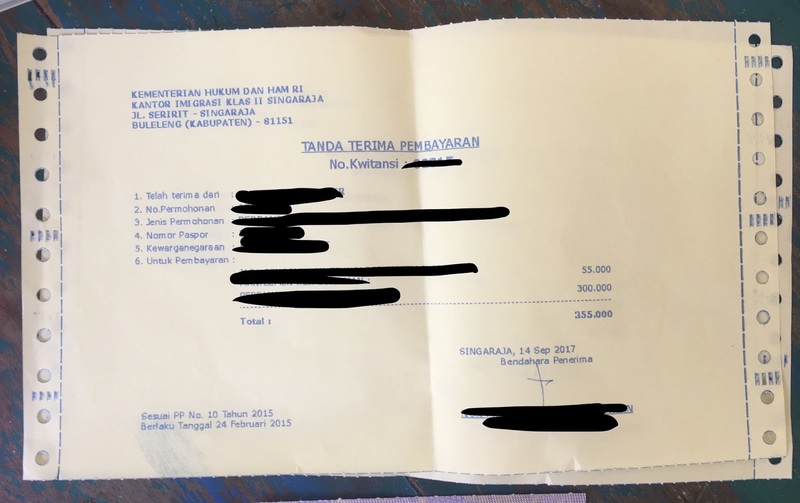 Now that you have extended your 30 day tourist visa on arrival, you can stay in Indonesia for 60 days total. Remember that the day you arrive and the day you leave both count in your 60 days total! 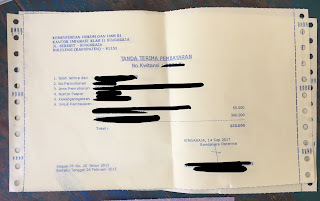 You can do this at any immigration office, but our experience at the Singaraja office was friendly, efficient (only took about 1.5 hours, if you include all three trips to the office), and extremely easy. Enjoy your extra stay in Bali! Ofcourse meant to apply on 2nd April (not march) Greetings Helle and John. Hi Helle and John, I’m glad you found this useful! One concern is that the visa process typically can only be started two (2) weeks before your extension is required. This is what I have read on other sites, when people extend the visa in Denpasar. I’m unsure if this applies in Singaraja, but there is a chance that they will turn you away if you try to start the process as early as you are planning (over three weeks before visa expiry). If you’re near the office, I would say that since Singaraja is much smaller it is worth a try! They may be more lax on hard deadlines. However, do make sure you are planning to be nearby the visa office within your last 2 weeks of the visa so that you can get your extension if they won’t process it early. 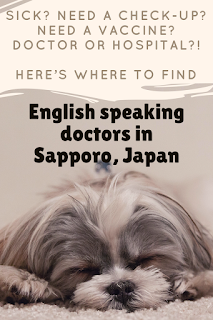 Please let us know how it goes — this is useful info for everyone! Have a great time in North Bali! We've decided (for now) instead of going North, we'll move towards East, Tempulan / Amed. Spends some days diving/snorkling, then be ready at the Singaraja office monday morning 9th april (following floating leaf's dresscode tip) starting the process, hoping it can be done by Friday 13th april. 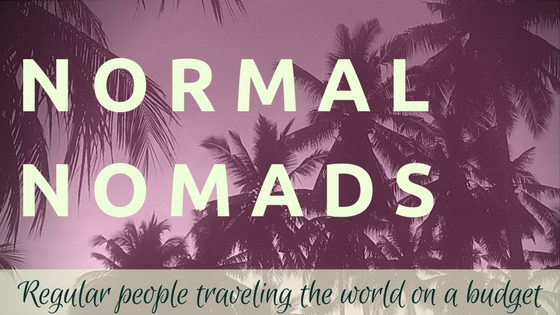 Ooh, we might do Amed and other Eastern areas in July — I’d love to hear about it!